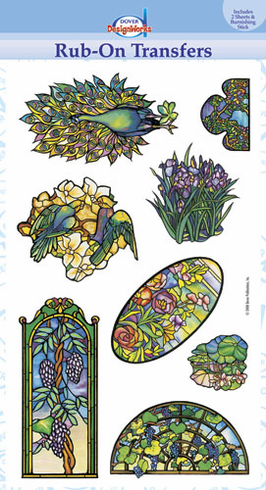 Inspired by the stained glass artistry of Louis Comfort Tiffany, these illustrations depict fruit, flowers, and birds in luminous colors. Each pack contains 16 transfers, with 2 images each of 8 different designs. Easy-to-follow instructions explain how to transfer the rub-ons to any appropriate surface using the enclosed burnishing stick.